m103 upper timing cover removal - rotor? 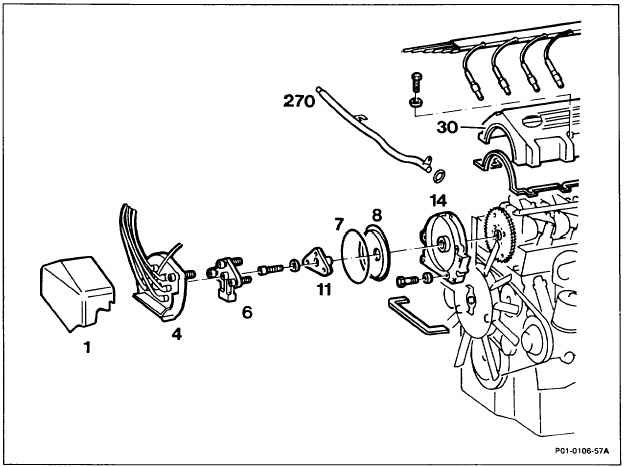 I've removed the distributor cap and rotor and removed the allen bolt that holds the "rotor mount?" to the cam. Do I need a puller to get this item out? No. You should be able to pull in right off after you unscrew the center bolt. They can get very stuck and it's quite common to ruin them in the process. I learned the hard it's best to do it on a weekday so you can go to the dealership and buy a replacement - which they should have in stock. i just did mine recently. the mb term for it, is "follower," which is either made of steel or aluminum. be sure to know what you have, since the torque is different for each application. what are you trying to do, anyhow? I was trying to remove the timing cover and the item I was stuck on is shown as #11 in the picture. I did finaly get it out by prying on it with small bars on either side but it was in there pretty good. It seemed to have a yellow sealant on it which made it bind. It's made out of aluminum.